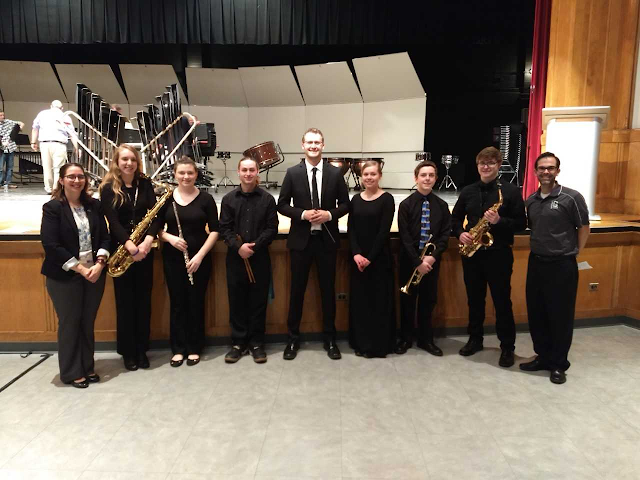 Left to Right Mrs. Lewis HS Band Director , Senior Emma Teeter, Senior Breanna Bailey, Senior Jordan Miller, Conductor/Composer Carl Holmquist, Freshman Felicity Lance, Senior Max Onkst, Sophomore Dawson Shirley, and GMS Director Brian McKibben. Members of the Greenville High School Symphonic Band and Wind Symphony performed with the 90 member OMEA District XI High School Honor Band on Sunday, January 28, 2018. GHS students joined students from 25 other High Schools from District XI to prepare four musical selections. The OMEA District XI covers Darke, Miami, Logan and Shelby County.The ensemble is an audition only ensemble and 154 students auditioned and the district took 90, 6 of those students were Greenville students. Our very own senior Max Onkst placed first chair on trumpet, which means he is the top Trumpet player in District 11! Students met for the first time on the morning of Saturday, January 27, 2018 at 8:00am. The band rehearsed from 8:00am-4:00pm that day with a lunch break and forty-five minutes of sectional time. Sunday, the students met at 1:00pm for a brief rehearsal followed by a concert presented for a large and receptive audience at Troy High School. This year's guest conductor/composer was Mr. Carl Holmquist. Carl is a successful Instrumental Music Teacher in Arlington Virginia, he has also given presentations at the Midwest clinic. Finally Carl has written many compositions for varies wind bands including our very own GMS Concert Band. On this concert the District XI students premiered his piece Shining Through. This was a positive weekend for these students and if you see them in the hallways please congratulate them on a job well done.